With the VIXIA HF R80 camcorder, the power to create wonderful video memories with your family is at your fingertips. This lightweight camcorder gives you up to 6 hours of recording time and the flexibility of an extensive optical zoom, making it ideal to take on trips, everyday adventures and more. Start recording from the get-go with the easy-to-use interface, and expand your creative possibilities with versatile features such as flexible slow and fast recording. Highlight Priority mode has been improved with backlight correction to help produce stunning shots you can be proud of. Record remotely by using the VIXIA HF R80 alongside the free Camera Connect app* on your compatible smart device, and when you've picked your favorite video memories, upload them online for the world to see. You won't miss any of the action when shooting video with the VIXIA HF R80 camcorder and its impressive 57x Advanced Zoom range. Long-range shooting allows you to create videos with dynamic variety, and is less likely to disrupt the action you're shooting. It's ideal for formal ceremonies, animals in the wild, candid family videos and more. Available in manual mode, Advanced Zoom takes the camcorder's telephoto power from 32.5mm all the way to 1853mm (35mm equivalent) for amazing flexibility in shooting. For more convenient shooting and better creative control over your videos, the camcorder offers continually variable Zoom Speed settings with 15 levels available. Canon's sophisticated SuperRange Optical Image Stabilizer helps correct camera shake quickly, so even handheld video taken at long focal lengths can be sharp and steady. Providing continuous adjustment throughout the entire zoom range to correct a broad range of motion, the Dynamic Image Stabilization system on the VIXIA HF R80 camcorder stabilizes rotational camera shake. Controlling rotational camera shake – horizontal, vertical and roll axis – helps ensure smooth, virtually distortion-free video, even when you're walking while shooting. The VIXIA HF R80 camcorder is equipped with a 3.28 Megapixel Full HD CMOS Image Sensor to capture your memories in true 1920 x 1080 resolution. Canon's advanced, high-resolution HD CMOS Image Sensor features extra sensitivity that delivers beautifully lifelike Full HD video with natural color, even in low light. On-chip noise reduction brings bright clarity to every frame. Video is rich, clear and amazingly detailed anywhere you view it, even when played back on a large HDTV. 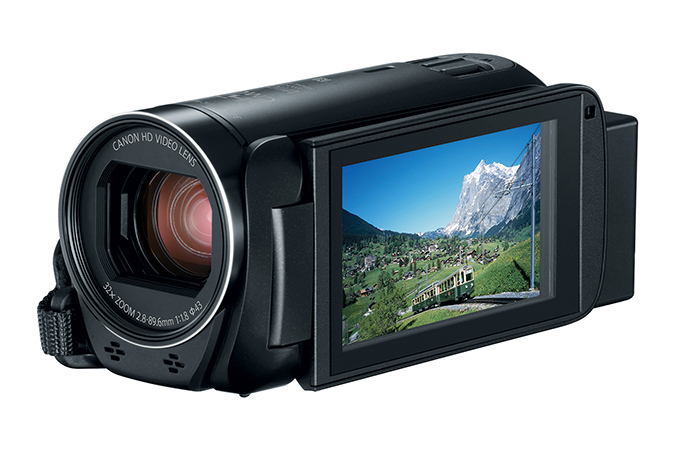 The VIXIA HF R80 camcorder incorporates the powerful DIGIC DV 4 Image Processor for outstanding imaging performance. The DIGIC DV 4 Image Processor captures more light, for brighter, virtually noise-free images even in dark scenes. It also speeds up operation and enables steady image stabilization for clear images even when shooting handheld. Record up to 6 Hours of Video (16GB). The camcorder's internal 16GB Flash Drive holds up to 6 hours of crisp, high-definition video. You can also record to a removable SD memory card for easy sharing with friends and family. Conveniently sized and readily available, SD cards give you up to 64GB (24 hours) of recording capacity for a combined capacity of up to 80GB or up to 30 hours. You can also backup your video directly to an external hard drive by using the optional UA-100 USB Adapter. The VIXIA HF R80 camcorder gives you high-quality MP4 recording. 1080/60p recording captures a large amount of information, virtually eliminating diagonal noise so even fast-moving subjects can show up crisply. This great sense of detail and faithful rendering of moving edges, plus enhanced color and fine tonal gradation, helps you take advantage of all that Full HD has to offer. Files are captured at a bit rate of up to 35 Mbps, so image quality is incredibly high. Keep the VIXIA HF R80 with you for life's unforgettable memories. A lightweight, compact and convenient body means you can have the camcorder ready for those extraordinary moments, with no need to worry about it taking up precious luggage room for your vacations, outings and family trips. The VIXIA HF R80 camcorder features a 3.0-inch capacitive touch panel LCD screen that's bright and clearly visible, even outdoors in the sun, with rich, natural color reproduction. Its streamlined user interface makes choosing focal points, tracking moving subjects, and shooting and watching your videos easy and fun. Clear explanations pop up when selecting shooting modes and recording formats, so even new videographers can feel confident as they create impressive videos. The VIXIA HF R80 camcorder is powered by a high capacity Battery Pack BP-727. The rechargeable lithium-ion battery not only lets you shoot for long periods, but features intelligent technology that can accurately indicate remaining battery time for extra insurance that you won't miss an important shooting opportunity. The VIXIA HF R80 camcorder delivers flexible Slow and Fast Motion capabilities for a variety of customizable recording options. You can record slow-motion images at speed settings down to 0.5x, ideal for checking out your golf swing or creating movie-like slow-mo effects. Fast motion has a top speed of 1200x, recording an incredible 20 hours of action in a single one-minute scene. You can even choose new speed settings of 300x and 600x for added flexibility. Capture your memories exactly as you see them with the improved Highlight Priority Mode, which helps to prevent loss of detail in high brightness areas. Now featuring Backlight Correction, the VIXIA HF R80 camcorder delivers footage that's more balanced and realistic, leaving you with beautiful memories to enjoy for years to come. Designed to be displayed on bright LCD TVs, you can show your videos at a high brightness setting for accurate and pleasing results. 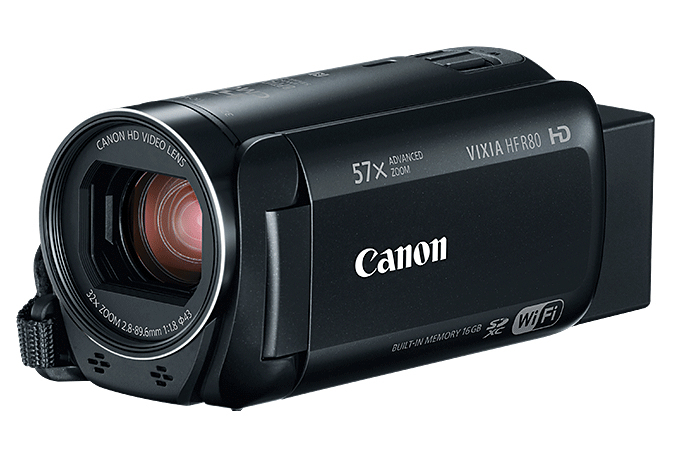 Built-in Wi-Fi® technology on the VIXIA HF R80 camcorder lets you easily share your HD video with friends and family. Connect with compatible networks and devices using the free Canon Camera Connect app*. Share videos and photos with CANON iMAGE GATEWAY# – a free online photo storage service that lets you upload to social networking sites. For easy file transfer, you can also use CameraWindow DC to directly save your videos and photos to your computer. Wireless connection between the VIXIA HF R80 camcorder and your NFC-equipped smartphone can be seamless with Canon's free CameraAccess plus app. With the app installed, you can simply touch the camcorder to your compatible smartphone to transfer video and images or live stream events as they happen. You can even control the camcorder remotely, monitoring infants while they sleep, or keeping an eye on pets or home security from the office. Unlock new wireless possibilities by combining Canon's free Camera Connect app with the VIXIA HF R80 camcorder's built-in Wi-Fi® capabilities. It allows you to use your compatible smart device to shoot remotely, providing a wide and flexible degree of functionality – ideal for group shots and capturing family moments with you in the center of the frame. The Camera Connect app also lets you share your videos right away with friends, family or anyone in the world by uploading directly to social networking sites, email or the cloud. The app is universal to similarly equipped Canon cameras, meaning you can flip between your different devices quickly and easily. Stream video from your camcorder where you like with Live Streaming on the VIXIA HF R80 camcorder. It lets you receive the live video and sound that your camcorder is recording from a remote location on your compatible smart device not only when you're on the same wireless network but over the internet too! With the CameraAccess plus app, you can also use your compatible smartphone or tablet for remote recording and control, and even access information about remaining battery charge, recordable time and more. To complement the VIXIA HF R80 camcorder's long-distance recording capability, Zoom Framing Assist helps keep distant subjects in the frame. When you're shooting at the long end of the zoom and you've lost your subject, simply press an icon on the touch screen and the zoom magnification will automatically decrease, making it easy for you to locate and zoom in on the subject. Available in Auto or Manual mode, Zoom Framing Assist helps you accurately track and capture your subject. 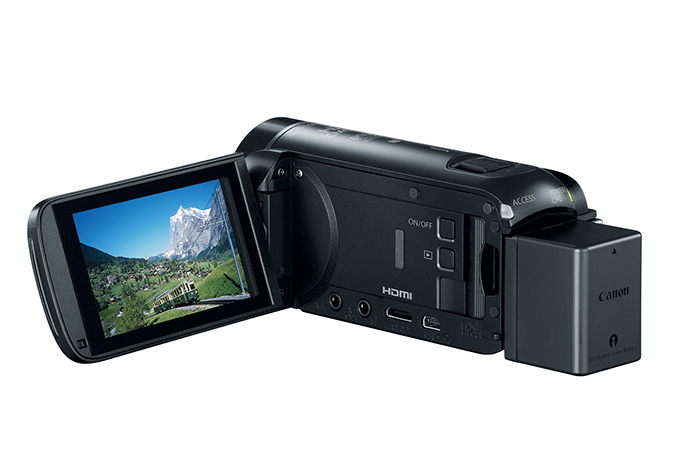 The VIXIA HF R80 camcorder has a built-in downconversion function that helps make it easy to share your video online. For example, if the file happens to be too big to send, you can reduce the resolution of your videos while minimizing distortion to help ensure your family and friends will be able to watch them with virtually no loss in quality. With your Wi-Fi® enabled camcorder mounted on the optional Camera Pan Table CT-V1, you can use your compatible mobile device^ to remotely monitor a large viewing range, use Live Streaming on the camcorder or control it remotely over the internet and the CameraAccess plus app. Able to plug into an outlet or run on AA batteries, the Camera Pan Table CT-V1 also powers your camcorder and features an energy-saving mode for long use. 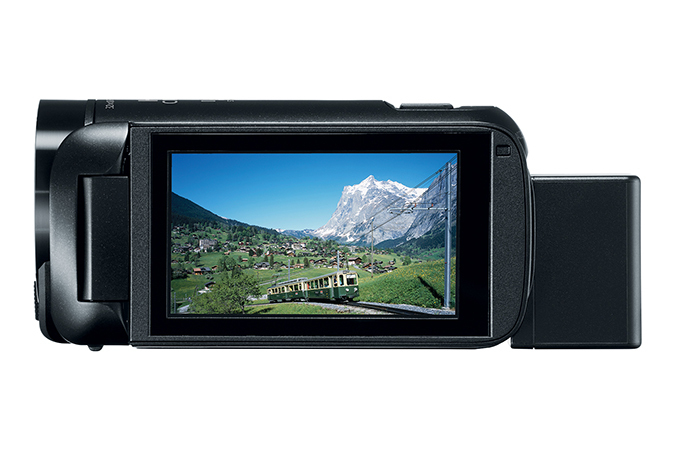 The VIXIA HF R80 camcorder is fully compatible with Canon's photo and video storage device: the Canon Connect Station CS100. It provides up to 1TB of hard drive space, storing approximately 150,000 photos or approximately 70 hours of video content^^. For ease of use, it features NFC for quick file transfer, as well as simple menus for easy file storage, managing and sorting. Images and videos can then be viewed in Full HD on an HDTV, sent for printing and more.